Gehl began manufacturing agricultural implements out of West Bend, Wis., in 1859. From those humble beginnings in a blacksmith shop, the Gehl brand has become a major force in the compact equipment industry worldwide. Today, Gehl’s cutting-edge research and design facility is still located in West Bend with North American manufacturing operations in Yankton, S.D., Madison, S.D., Waco, Texas, and Belvidere, Ill. Gehl introduced its first compact excavator range in 1987. The now fourth generation Gehl excavator product offering provides key, market-focused models with customer-driven features. Over the years, Gehl excavators have become more user-friendly with features like zero and minimal tail swing for operation in tight places and large comfortable cabs with superior visibility. Today, Gehl’s compact excavator range consists of eight models: the M08, Z17 GEN:2, Z25, Z35 GEN:2, Z45 GEN:2, Z55, Z80 GEN:2 and M100. The smallest in the line, the Gehl M08, offers condensed dimensions with a width of only 27 in. and a length of 8 ft, 6 in., making it easy to transport as well as maneuver on sidewalks and travel through gates and doorways. The largest machine, the M100, opens up doors for dealer-owned rental fleets, utility contractors, commercial construction and agricultural markets. This groundbreaking machine has a dig depth of 14 ft, 10 in. and operating capacity of more than 20,000 lbs with a robust minimal tail swing that will go 60 degrees in either direction to allow consistent digging without repositioning. 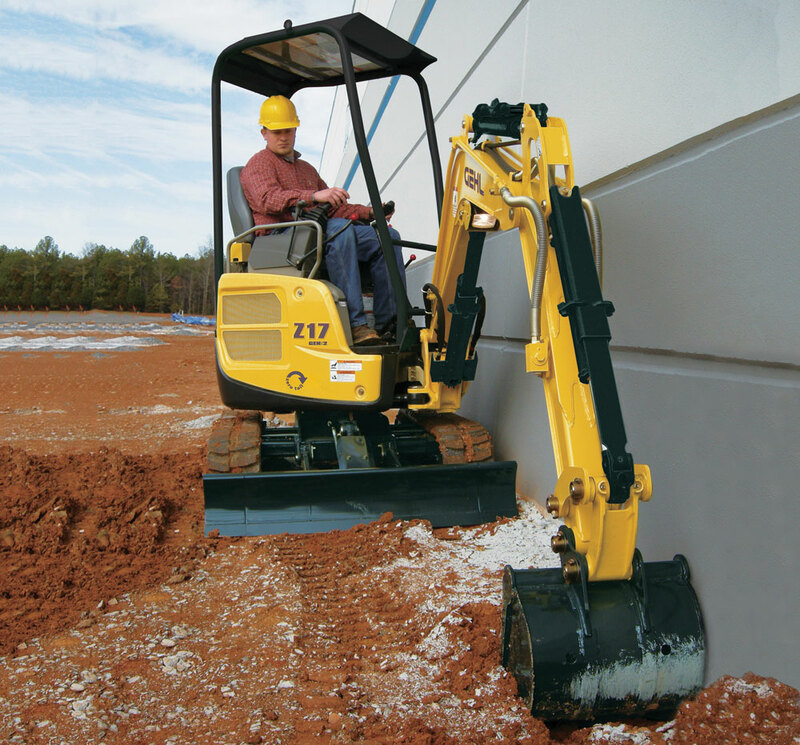 Each Gehl excavator model is built around a powerful and reliable Yanmar engine. The hydraulic system is designed to enhance engine performance, resulting in a more efficient system. The Z models are true zero tail swing machines, eliminating cab overhang beyond the tracks in all directions. This allows the machine to operate directly against a wall or other obstruction without causing damage to the structure or machine. The M models have a minimal tail swing design that provides additional stability and operator comfort. When rotated, the tail overhangs the undercarriage by less than 20 percent and cast side protectors provide added protection at the base of the house. Two variable pumps and two gear pumps are incorporated into the hydraulic system in Gehl excavators. The pump oil flows are efficiently combined, redirecting oil to where it is needed and allowing for simultaneous operation without loss of hydraulic power. The M100, Z35 GEN:2, Z45 GEN:2, Z55 and Z80 GEN:2 excavators add the Eco Mode feature. This mode reduces engine rpm by 10 percent without sacrificing power when activated, saving fuel when full speed is not necessary. Gehl compact excavators transform to meet the needs of landscape, utility, construction and rental applications with the wide variety of Edge attachments available. The versatility and features of the Gehl compact excavator line means less downtime and better return on investment. Learn more about Gehl here.